George Marsh was a resident of Deane, living at a farm on Broadgate (renamed Junction Road / Junction Road West). He was a devoted Christian who preached at Deane. Research has shown that he was not a vicar as some have suggested, or an ordained minister. 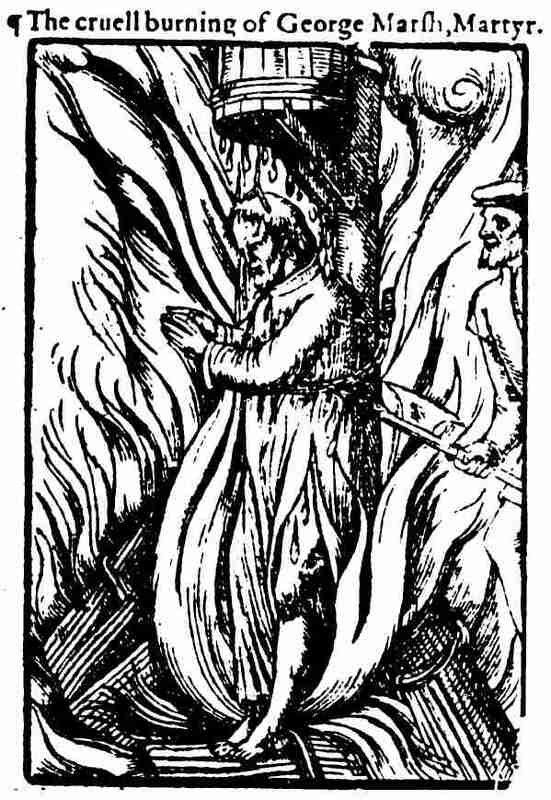 Most of our information comes from Foxe's Book of Martyrs. The John Foxe website gives the full text of four versions of the tome but due to technical reasons we can only provide a link to that site. Alternatively, an eBook can be downloaded. You may need to download an ePub reader such as Adobe Digital Editions to read it. There is a monument to George Marsh in the Chester district of Boughton. It is located near to St Paul's Church on the A51 (postcode CH35BH). Just one of many websites to give a location is www.chestertourist.com. Another is www.waymarking.com.